A food newsletter. Issue 7. Can you please share this newsletter with someone who might enjoy it? That really helps me out. Thank you. When summer comes, it's hard for me to approach pasta with the same red-sauce treatment it gets the other 9 months of the year. What are preserved lemons exactly? They're lemons in a salt bath. They last forever and add a puckery note of salinity to pizza, chicken, lamb, fish, rice, and — of course – pasta. Look for them in the supermarket near the olives and capers. This recipe is more about the flavor combination than the precise measurements and method. Play fast and loose if you want. It's a good occasion for using whole-wheat pasta, too — the slightly nutty whole-grain flavor complements the other elements. In a skillet over medium heat, cook the bacon —stirring occasionally with a spatula — until crisp, about 10 minutes. Set the bacon aside on a paper towel to drain. While the bacon cooks, boil salted water for the pasta. Cook until al dente. While the pasta cooks, remove the seeds from the preserved lemons: Chop each lemon in half along its equator and use a fork to fish out the seeds. , Reserve a few thin slices of lemon for garnish and then finely chop the rest. 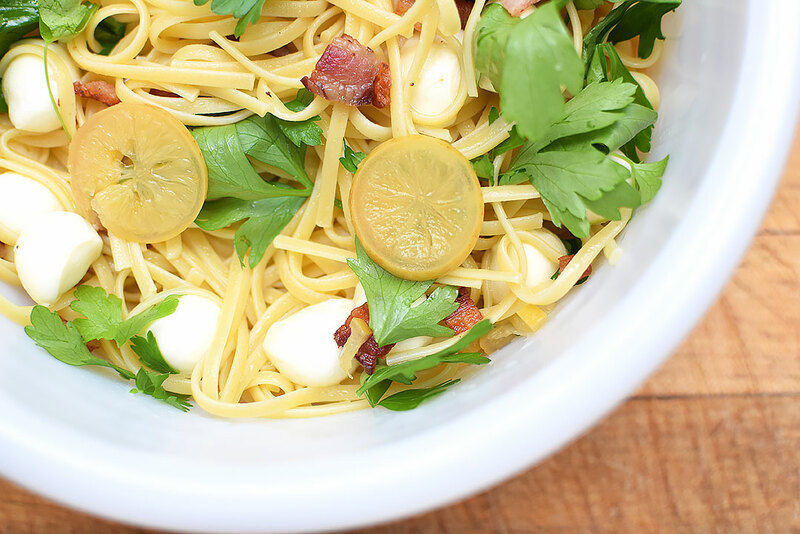 When the pasta is cooked, place it in a large serving bowl and toss it with the bacon, chopped lemons, mozzarella, and most of the parsley. Garnish with the lemon slices and a few leaves of parsley. If you watch just one video this week about automated lettuce harvesting, let it be this one [Wired]. Only $2 on Kindle: Jeni's Splendid Ice Creams at Home [Amazon]. Thanks to cold storage, your apples could be a year old [Extra Crispy]. Serious Eater and cookbook author J. Kenji López-Alt is opening a restaurant [Amazon | Eater]. 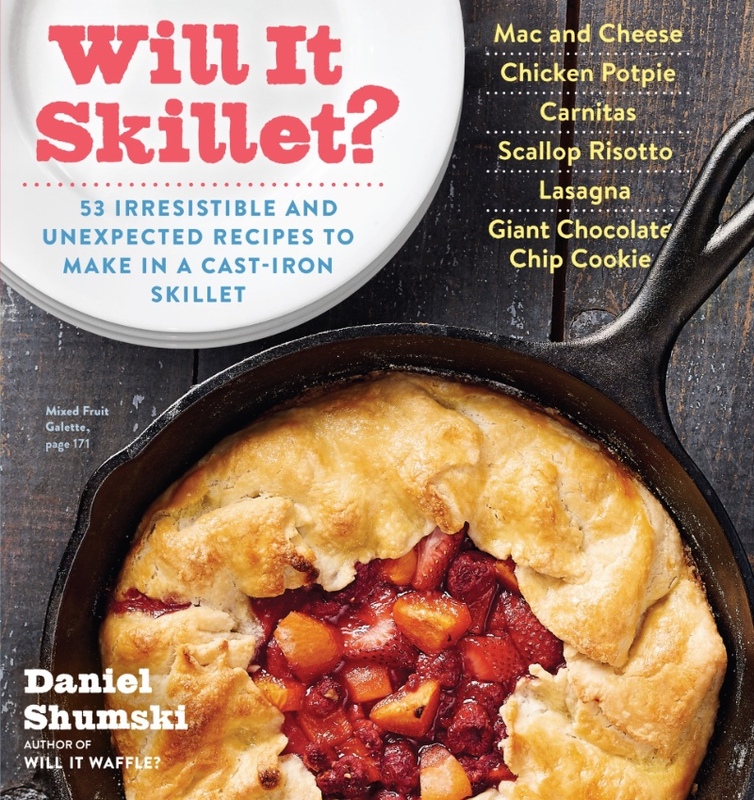 Whether you're a cast iron novice or a devoted fan from way back, you can enter to win my latest cookbook, "Will It Skillet?" Five people will win. No purchase is necessary. U.S. and Canadian residents are eligible. Copyright © 2017 Daniel Shumski, All rights reserved.